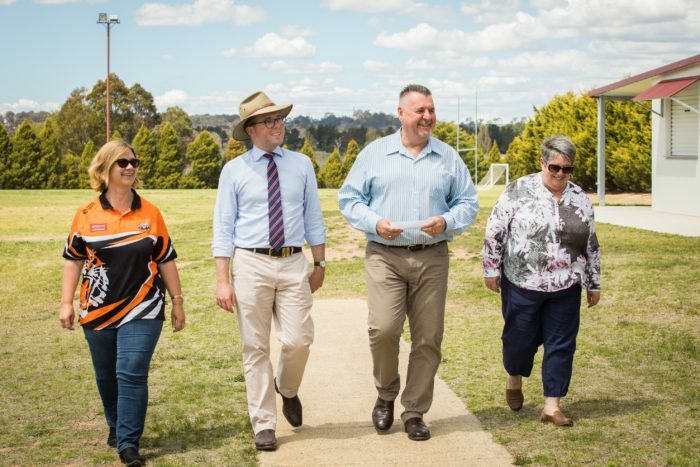 URALLA’S Sporting Complex will soon be kicking more goals with an announcement this week from Northern Tablelands MP Adam Marshall that it has won another $247,292 in NSW Government funding grant to upgrade grounds and amenities. Mr Marshall was in Uralla this week to meet with Mayor Mick Pearce and sports group leaders to deliver news of the funding. The funding will bring a range of new sports infrastructure elements to the complex on Racecourse Road that is used by more than seven sporting codes in the town. Mr Marshall said the latest grant from the second round of the Stronger Country Communities Fund will build on $250,000 worth of improvements completed at the Uralla complex earlier this year. “This funding is another giant step in making this complex a forerunner in modern regional sports precinct rankings,” Mr Marshall said. Mr Marshall said the complex was home to junior soccer, cricket, tennis, junior rugby league, netball, basketball and squash, but the developments planned for this project would bring benefits to even more sports and exercise and healthy lifestyle advocates. “There’s a range of improvements that will add to the sporting environment here for everyone who uses it,” Mr Marshall said. “That includes a bitumen seal for the car park and the entry to the sporting precinct, as well as ground upgrades with new socketed combination goal posts, mini grandstands, seating, two new barbecues, a water bubbler and exercise stations. “And there’s going to be patching and painting of the change rooms, repairs to the roof of the squash court, a new cricket wicket and new playground equipment. It’s a sports bonanza for all the good sports, and sport fans, who come here. “Securing more funding for upgrades here is essential for the continued growth and development of local sport in Uralla. Cr Pearce said the latest project would deliver a quality sporting complex that would add to its multi-purpose appeal. “It will be a very professional outfit when all’s done and dusted,” Cr Pearce said. Uralla Cricket Club secretary/treasurer Leigh Kelly said the funding was a fantastic surprise for local cricketers and would help “no end” in getting improvements to their ground. The latest works will add to the $252,000 in upgrades to the complex unveiled earlier this year which included new canteen facilities, a covered courtyard, improved disabled access and upgraded footpaths. The NSW Government chipped in $132,400 to those essential works.